Samsung Electronics Co. Ltd. eked out a slim lead in market share over Motorola Inc. in the United States last year according to new numbers from IDC. Where Samsung showed 15.5% year-on-year growth between 2007 and 2008, Motorola showed a 38% drop. LG Electronics Co. grew 30.4% in the same period and expected to claim at least No 2 position in the 2009. Motorola’s reversal of fortune was stark: In 2007, the American vendor claimed fully one-third of its home market, which has dwindled to well less than one-quarter. This year is going to be neck-to-neck race between the 2 Korean mobile companies and don't be surprise LG overtaking Samsung. 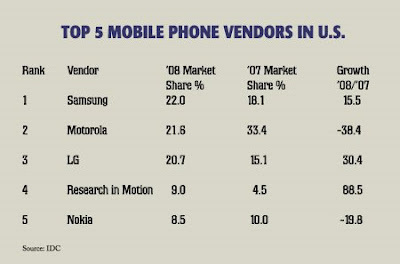 RIM, the fourth-place vendor, claimed 9% share and Nokia Corp. earned fifth-place with 8.5% share. Apple Inc. took sixth place with 4%. The US market is increasing its popularity on smartphones who now buy smartphones in greater quantities than their Western European counterparts with RIM showing 88.5% year-on-year growth between 2007 and 2008, and Apple grew 101%. Smartphone shipments in the U.S. shot up 68% in 2008 over the prior year, while smartphone growth in Western Europe reached 37% in the same period. Samsung and Motorola, however, held down the bottom of the top-five smartphone vendor list, led by RIM (46% U.S. smartphone share), Apple (21%) and Palm (9%). Samsung had 6% and Motorola 5%. Where is Nokia? ?